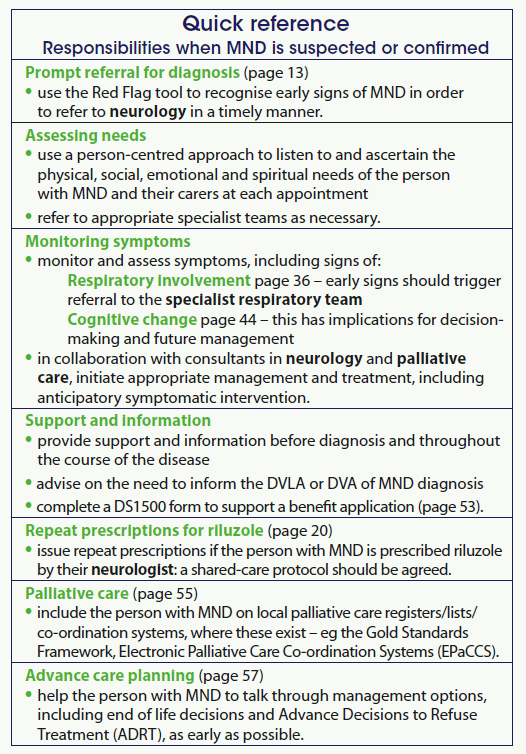 Home » Review » Condition Management » Motor Neurone Disease: A guide for GPs and primary care teams. “I was truly impressed by this document as it is comprehensive, informative and in my opinion extremely useful” – comment from Dr Nassif Mansour, GPSI and P-CNS chair. Jennifer Bedford Head of Partnerships at the MND Association. Six people per day in the UK are diagnosed with motor neurone disease (MND). MND is a rapidly progressive and terminal disease that attacks the motor neurones, or nerves, in the brain and spinal cord1. It can leave people locked in a failing body, unable to move, talk and eventually breathe. It affects people from all communities and a person’s lifetime risk of developing MND is around 1 in 300. It kills a third of people within a year and more than half within two years of diagnosis. There is, currently, no cure for MND and whilst research into one continues, other research and therapeutic efforts are firmly focused on managing symptoms and maximising the quality of life for people living with it. People living with MND, in keeping with all those with complex care needs, receive health and social care services from multiple providers and in different care settings. Good, person-centred care is based on the needs of the individual. Such care transitions between providers, for example GP, specialist clinics, hospital, and community provision in the home. GPs are essential to the effective care of people living with MND – they are often the service to which people turn, as they are visible and trusted within the community. Furthermore it is possible to instigate an appointment with them. Nassif Mansour, GPSI Adult Medicine, Neurology and Community Rehabilitation, Clinical Lead for Neurology – Kingston Clinical Commissioning Group, Chair of the Primary care and Community Neurology Society. In addition, the guide has quick reference sections and checklists to assist with practice, for example the chart right outlines the main considerations once MND is suspected. 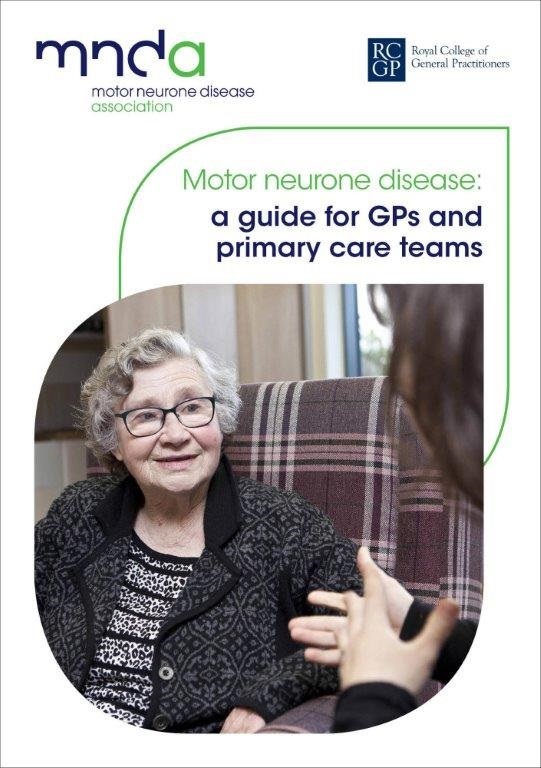 You can find an electronic copy of ‘Motor neurone disease – a guide for GPs and primary care teams’ on the Association website in the information for GPs section here. A previous article on the MND NICE guideline can be accessed from here. You can also order hard copies of the booklet from the Connect Helpline by calling 0800 802 6262 or emailing mndconnect@mndassociation.org. For further support there are also 2 accredited online modules on the RCGP CPD website which are highly recommended and may be found here. • local support and advice from staff and volunteers. Please do visit our website www.mndassociation.org to find out more about MND and our services. 1 Bäumer D, Talbot K and Turner MR. Advances in motor neurone disease. Journal of the Royal Society of Medicine. 2014; 107:14.